This year (2011) Mormon ladies have been learning about the history of the Church’s Relief Society, said to be “the Lord’s organization for woman.” Julie B. Beck, the Relief Society general president wrote that “understanding our history is not only important but essential” (Ensign, January 2011, 7. Emphasis in the original). Ms. Beck gave several reasons for knowing, understanding and valuing the history, as well as “the examples of noble Latter-day Saint women” of the Relief Society. 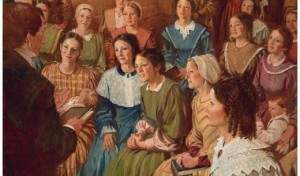 Therefore, most of the 2011 visiting teaching messages have included historical information about the early days of what was then called the Female Relief Society. This was the marital status of those women on March 17, 1842, but things soon changed for some of them. Three months after the formation of the Relief Society (i.e., in June 1842), one of those first members, Sarah M. Cleveland, became the 12th plural wife of Joseph Smith. Sarah was the “woman in her fifties” listed above. She was also married to John Cleveland at the time (and had been since 1826). She remained with John throughout her life. On the same day that Joseph Smith married Sarah Cleveland, he also married another woman who had been at the first Relief Society meeting: Eliza Snow. Unlike Sarah, Eliza had no other husband. The marriage was officiated by Brigham Young with Eliza’s Relief Society sister and soon-to-be sister wife, Sarah Cleveland, acting as witness. Eliza was 38 years old. In August Joseph Smith married another woman who had been at the first Relief Society meeting, Martha Knight. Martha was not one of the widows mentioned in the list above, but she was a new widow (of one month) at the time that she married Joseph. She was 37 years old when she became Joseph’s 16th plural wife. About a year later (June 1843) yet another original member of Relief Society married Joseph Smith. Elvira Holmes became Joseph’s 27th plural wife, just six months after she had married Jonathan Holmes. After Joseph Smith’s death, Jonathan stood in as proxy when his wife, Elvira, was married to Smith for eternity in the temple. Desdemona Fullmer was another woman who had been at the first meeting of the Relief Society to later wed Joseph Smith. In July 1843, at the age of 34, Desdemona became Joseph’s 29th plural wife. Within a year and a half of the initial Relief Society meeting, Joseph Smith had married five of the twenty women who were at that meeting. At the actual time of the meeting, he was already married to one of those women, Emma. So we see that Joseph Smith married 30% of the original Relief Society members. On the same day that the Relief Society was organized, another group of women were presented and accepted for membership in the Relief Society. In that group of seven women was Miranda Hyde, wife of LDS Apostle Orson Hyde. Orson was away serving a mission overseas when Miranda became Joseph Smith’s 10th plural wife in April of 1842. One more of Joseph Smith’s plural marriages had ties to that March 17th Relief Society meeting, though the young woman herself was not present. Elizabeth Ann Whitney was among the twenty initial members. Two months later Joseph Smith introduced Elizabeth and her husband Newel to the doctrine of plural marriage. After coming to embrace it, the couple gave their 17-year-old daughter, Sarah Ann, to the Prophet. Sarah became Joseph Smith’s 15th plural wife on July 27, 1842. Nine months later Sarah entered into a “pretend marriage” with Joseph Kingsbury; Joseph Smith performed the civil ceremony. I doubt that this aspect of the history of the Female Relief Society will ever be included in the Mormon Church’s visiting teaching messages; but if, as Ms. Beck said, “understanding our history is not only important but essential,” it certainly ought to be. This entry was posted in Early Mormonism, Joseph Smith, Mormon History, Nauvoo, Polygamy and tagged Joseph Smith, Julie B. Beck, Nauvoo, Polygamy, Relief Society. Bookmark the permalink. Warren Snow was Bishop of the Church at Manti, San Pete County, Utah. He had several wives, but there was a fair, buxom young woman in the town that Snow wanted for a wife…. She thanked him for the honor offered, but told him she was then engaged to a young man, a member of the Church, and consequently could not marry the old priest…. He told her it was the will of God that she should marry him, and she must do so; that the young man could be got rid of, sent on a mission or dealt with in some way… that, in fact, a promise made to the young man was not binding, when she was informed that it was contrary to the wishes of the authorities. grindael, thanks for you additional research. But the Fact is that NYT is NOT quoting Hirshson (Hirshson wrote in 1969, NYT article is from 1860), and Hirshson (1969) is NOT the author (originally) atttibuting this to Kimball (the writer of the article did in 1860). Did you use the link to NYT that I posted? Did you read the article? I hold out the possibility that you just mistated yourself in your writing. If not, then your talk of “due diligence” and other slander of Dale is ironically juxtaposed to this evidence of your own lack of diligence and your own automatic accusation. I hope you just wrote incorrectly. failure of their apostles to be faithful in relaying spiritual truth form Jesus. quote “Larry King: You condemn it [polygamy]. Gordon B. Hinckley: I condemn it, yes, as a practice, because I think it is not doctrinal. It is not legal. And this church takes the position that we will abide by the law. We believe in being subject to kings, presidents, rulers, magistrates in honoring, obeying and sustaining the law. I was thinking about this interview with Larry King and wrote off the top of my head. I’ll be more careful from now on. It still doesn’t change the fact that Pres. Hinckley condemned it yet knew full well that it is practiced everyday in Mormon temples. My question still stands as well, Gordon B Hinckley said he condemns the practice so why do LDS members still defend it to the bitter end? Could it be that gpark has it right? The LDS see the doublespeak and know what he meant? Pres. Hinckley also stated that it isn’t legal. Well it wasn’t legal at anytime during Mormonism, so what does that matter? I am sickened at what was done to Thomas Lewis. If this doesn’t show the Mormon people what kind of men have been at the head of the LDS church, I don’t know what will. It almost seems as if some women enjoyed working the system. Getting themselves a “higher up” for the Celestial Kingdom. Too bad that the men they believed would be taking them there, thought no more of them than they did a cow. Hmmmm, where is Jesus in any of this? Does Jesus think of women as no more than cattle? Sickening. I wonder if the girl ever became a wife of Warren Snow? the internal dissent over polygamy which led to Joseph Smith’s arrest and assassination. This was the gospel preached by Mormon apostles when they “restored” Jesus’ gospel .